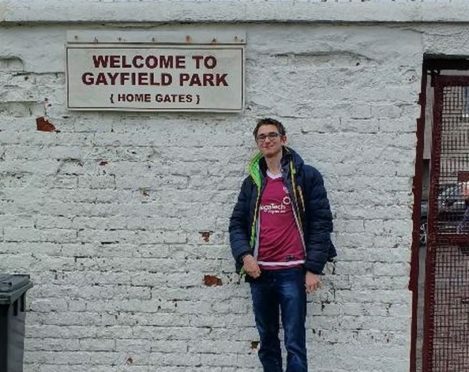 Piotr Borczyk from Zawiercie realised his dream of watching the Lichties in the flesh on Saturday after striking up a long-distance love affair with the Gayfield club. A 1-0 derby win against Montrose followed a sightseeing trip around the harbour and Arbroath Abbey before the day was capped off with a fish supper from Peppo’s. Saturday’s visit to Gayfield was also only the second time that Piotr has seen the sea as he lives miles inland in Poland. 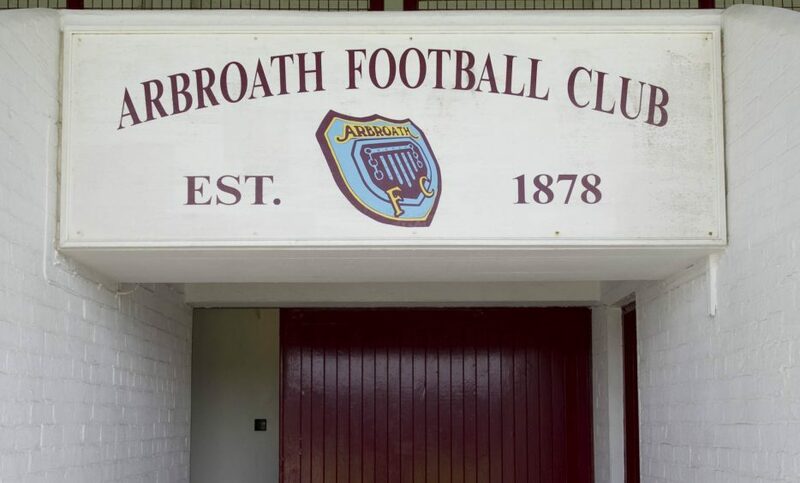 The 16-year-old has been a fan of Arbroath for the past few years. He was first told about the club by his friend Troy Scott who travels from Edinburgh to watch every home and away match. Troy updates Piotr from Scotland on the club’s fortunes during FIFA football games which they play online against each other on the Playstation. Piotr said: “My friend Troy who goes to all of the Arbroath games told me about Arbroath when playing FIFA on the Playstation. “I became intrigued about the club and Googled them and have wanted to come to a game ever since. “My favourite player is Bobby Linn but I also like Ricky Little since he scored on Saturday. “I keep track of scores through the internet but also Troy tells me what happened in the games. “I flew from Poland to Edinburgh for this game as I was hoping for title celebrations and drove from Edinburgh with Troy and his dad for the game. Arbroath could win the League One title with victory at Brechin on Saturday but Piotr will have to follow proceedings online. 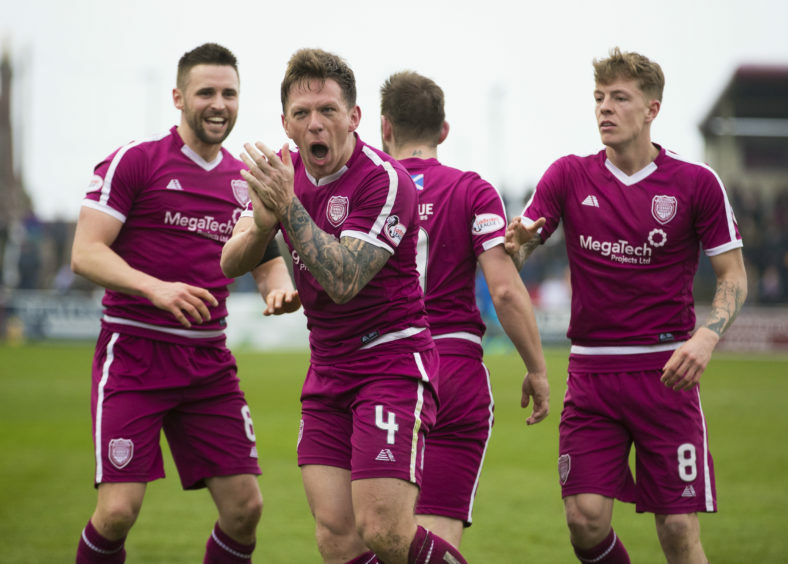 His flight back home leaves on Friday but he’s promising to come back next season and watch Arbroath play in the Championship – if there is indeed a promotion party. Troy said: “We became friends through his cousin who is my best friend. “I have gone to Poland twice with my friend and that’s where I met Piotr and we play Playstation online together a lot which is how I let him know what’s happening with Arbroath. A spokesman for Arbroath FC said: “The passion our club’s fans show has always been infectious to others and we are now lucky to have supporters from all corners of the world”. Piotr joins a growing band of Polish fans flying the flag for Arbroath – including Andrzej Lorkowski who won hearts in Russia last year. He flew there to watch his country’s World Cup group games against Senegal, Japan and Columbia and was given a treasured Scotland flag to take with him by Arbroath supporter Sye Webster which makes reference to the Lichties record-breaking 36-0 Scottish Cup win against Bon Accord in 1885. The flag – emblazoned with ‘Arbroath FC 36-0 World Record Holders’ – was bought for £250 in 1982 for the Spain World Cup and has been to countless Red Lichties games and travelled all over Europe for Scotland matches.